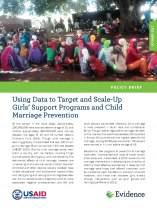 This brief is for policy makers and program designers interested in bringing low-cost child marriage prevention interventions to scale. It introduces the Child Census tool, which can be used to identify locations where the greatest numbers of girls are out-of-school and/or married, serve as a rapid baseline survey for project interventions, and monitor the impact of interventions in the areas with the highest rates of child marriage. This rapid tool assesses the status of both girls and boys in communities where it is undertaken, and allows programmers to create a tangible, data-driven justification for programmatic focus on girls. It can also contribute, generally, to evidence-driven programming for children and youth. The Child Census tool was developed as part of the Berhane Hewan program in Ethiopia, a partnership between the Ethiopian government and the Population Council.